I remember spotting a woman at the grocery store not too long ago, wearing a shirt that read, “Will Work Out for Fries.” The problem with this sentiment, along with similar ones, is that it posits physical activity as compensation, or penance, for consumption, a problematic belief that can trigger disordered behavior. 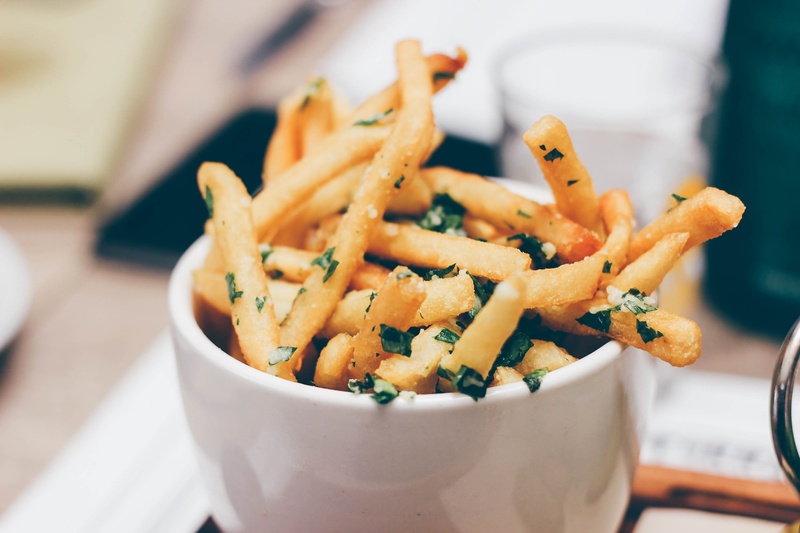 When we believe that fries must be “burned off” through physical activity, we up the ante at the gym, a slippery slope toward compulsive exercise and/or toward creating a dangerous pairing between eating and compensatory behaviors. So, what is the link between exercise and eating fries – or cheesecake or pizza or anything else that diet culture tells you not to eat? Engaging in physical activity is a health-promoting behavior. We know that movement improves our physical and mental health. Exercising might clear your mind, create a challenge for you, distract you from your daily stressors, or provide you some much-deserved “me time.” A flexible relationship with food, one that allows you to satisfy cravings and engage with food socially, naturally, and spontaneously, is also a health-promoting behavior. It results in reduced binge/emotional eating, reduces obsessive thinking about food, and increases the ability to relate to food easily and unemotionally – all of which promote general well-being. Also, eating intuitively and in response to particular cravings at times is fun. It’s enjoyable. It’s what gives life flavor and spark. Moving your body, if done intuitively and non-punitively can serve a similar function. Physical activity is innately rewarding, unless you devise a set of rules or expectations that rob it of its inborn joy. Spend some time watching children move to remind yourself that this is true. So, eat the fries and go for that walk or run – not because you have to “burn them off” – but because both are examples of healthy and life-affirming being in this world.